Veal sweetbreads are highly prized by chefs and connoisseurs for their mild flavor and velvety texture. In this recipe, they are paired with a tangy citrus butter the flavor of which provides a sharp contrast to the delicate sweetbreads. The crisp vegetables give an extra element in terms of both flavor and texture. Blanch the veal sweetbreads, refresh in cold water. Drain, peel away the outer membrane. Arrange trimmed sweetbreads in a single layer, cover with a kitchen towel and place a weight on top. Refrigerate overnight. Cut the veal sweetbreads into 140 g portions, set aside the trimmings to stuff the morel mushrooms. Wash the morel mushrooms, cook in butter over a low temperature; remove from the pan. Cut the reserved veal sweetbread into a dice, add to the same pan and cook, season and add the chopped chives. Stuff the morel mushrooms, return to the pan and keep warm. Cook the vegetables separately in boiling salted water, refresh immediately. Trim the ends of the carrots. Bring the orange juice to the boil with half the orange peel and all the lime peel. Whisk in the cold butter, season. Season and coat the veal sweetbread portions in dried morel powder. Heat clarified butter in a pan, add the sweetbreads, and cook until golden brown. Cook in the oven for 15 minutes, basting frequently. 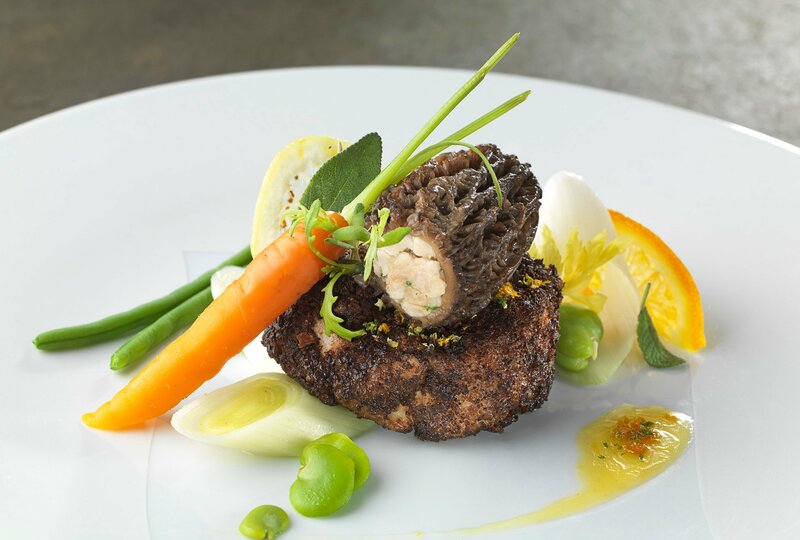 Place a veal sweetbread in the center of a plate, top with a stuffed morel mushroom. Arrange the vegetables harmoniously around along with lemon and orange slices. Decorate with sage leaves and baby rocket (arugula). Place a line of citrus butter on the plate, sprinkle with the remaining orange peel and chopped sage leaf.